The Secure Snuggler is a high end bed designed to combine, in the words of the designer, "skeletal support, soothing comfort and Lux style." Basically, what they designed is an outstanding bed for a pet that supports them while sleeping instead of a lumpy bag or bed that provides minimal comfort. The Secure Snuggler is a bed frame supporting a memory foam mattress wrapped in a cashmere/merino wool blend and other luxurious fabrics to choose from including micro suede and cotton twills. If it's big enough I might want to curl up for a nap in that. The Bed fit for a King or Queen! The handmade real gold bullion crown which adorns each Secure Snuggler bed. 10- They would like you to know they get a sore back too. 9 - They would like you to know that they hate bunn foam mattress fillers. 8- They would like you to know that while you think you are savingmoney by buying a $29.99 crummy dog bed at Target, they chew it up,spit it out and pee on it so you have to replace it three times a year. 7 - They would like you to know that, they are tired of hearing you bragabout your tempura pedic mattress to all your friends. Isn’t it abouttime you bought your dog an ergonomic pet bed with a memory foam mattress so he can brag to his friends? 6 -They want you to know that they are tired of having nothing to leanon and cuddle into when you finally push them away from you at night and tell them to lay down in their own bed. 5-They want you to know they have dreams about a real ergonomic pet bedwith walls that will not flop down in lackof support for his frail body. 4 -They want you to know that every bone in their body aches fromlaying on the lumpy bed that you would never sleep on yourself. 3- They want you to know they love you unconditionally and give you thebenefit of a doubt that you are ignorant to their needs. They give you a heads up by chewing up your socks andcrying in their sleep. 2-They want you to know it’s about time that you made the house looknice with a beautiful luxurious bed that is ergonomic and a beautiful classic piece of furniture that you don’t throw in the closet out of embarrassment when friends come over. 1 –And the number one thing they want you to know is...They love youmore than words could express anyway and they know deep down in your heart, when you realize they need to grow older in comfort, you'll by them an ergonomic bed. Dogs are people too! They love a good night’s sleep and you will notice some pretty dramatic changes in your dogs after sleeping and dreaming on an ergonomic bed. 1. They absolutely will not stop wagging their tails...even in their sleep. 2. They will start looking all over the house to collect their toys to put in their new bed. 3. They will clean their paws before stepping into their bed. 4. They will arrange their bed in an important and visible location. 5. They will bark and bark and become show-offs to attract attentionto the bed when company comes over. 6. They will romp and play and bounce like rabbits across the lawn because their joints feel so good. 7. They will put the lid down on the toilet when they are done drinking. 8. They will ignore you by pretending they are sleeping when you try to get them out of their bed. 9. They will growl at the mail carrier so they can be sent to their bed, as punishment (hee-hee). 10. They will never be a morning-dog again! Mackenzie Mauzy Emmy nominated best actress, co - staring in "Into the Woods" with Darcy. A Dogs Wish....causing a shift in humanity. Los Angeles , CA. 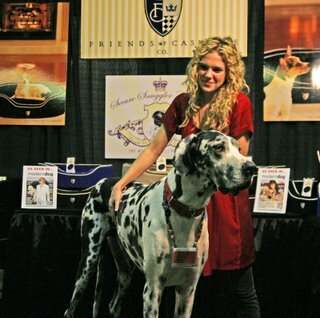 March 19, 2008 -- Friends of Cashmere have set a new standard in the pet industry. "Our mission is to inspire others to open their hearts to the possibility of becoming loving pet owners and animal advocates in their own neighborhoods. We hope that this "Wish" will be passed forward creating a chain of Universal love and goodwill towards animals throughout the World. It is up to us to cause a shift in humanity against any form of animal abuse. A dogs Wish changes the way we look into a dogs eyes. Something has to happen in the near future to stop what is happening in China! Something will shift....it is up to us...pass it forward, hang a Dogs wish on your refrigerator. Speak to me often for your voice is the sweetest music, as you must know by my tails fierce wagging. Please keep me inside for I am no longer wild & I ask for no more than to sit with you. Though if you had no home, I would rather follow you through ice and snow than rest in the warmest home in the entire universe for you are my friend. All I ask is that you keep my dish filled, for although I should not reproach you were it empty, I cannot tell you when I suffer thirst or hunger. I only ask of this so that I may stay well to romp and play and walk by your side to stand ready, willing and able to protect you with my life should you or those you love be in danger. And dear friend, should the Great One see fit to deprive me of my health, sight or make me feel pain that I do not understand, do not turn me away, rather hold me gently in your arms as skilled hands grant me merciful release from this earth and eternal rest with our maker. I will miss you then and wait for you to join me. As I leave this body I will be comforted knowing, even with my last breath, I was ever safest in your warm arms. Ergonomic Pet Beds: Do we really care about how our dogs sleep? Los Angeles, CA. Have you ever really taken into consideration how great the need is to provide a healthy resting for your pet? Pet care has been elevated on most levels. Our pets are being treated as family members more than ever before. To quote Plato, "The dog has the soul of a philosopher." A dog also has a skeletal and nervous system that needs nurturing and support. Why are 99% of all dog beds made from water absorbent, bun foam that offers no obvious support to our pets. Is it price? Is it because you can squeeze more into a shipping container and make it cost effective on a voyage from China. The time has come to rid our homes of bun foam and lumpy stuffed polyester mattresss. Our faithful companions deserve a dog bed that is a well-crafted and luxuriously therapeutic snuggler. Finally, we have found a dog bed that takes a stand for a dog's well being with plush fabric and soothing, ergonomic comfort that even humans would desire. “The Secure Snuggler is a high-end bed designed to combine, in the words of the designer, "skeletal support, soothing comfort and Lux style." This is an innovative design and an outstanding bed providing custom support from puppy through adult years. The Secure Snuggler is a moisture resistant, minicell bed frame and memory foam mattress wrapped in a cashmere/merino wool blend. 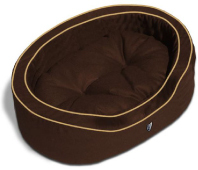 This Dog Bed gently soothes the parasympathetic nervous system making way for peaceful sleep and rest. "If it's big enough I might want to curl up for a nap in it”. Chris Adams, About.com Health's Disease, and Condition Medical Review Board. We have also learned that this company has been on an unbridled rampage of communication to pass forward “A Dogs Wish” at www.dogswish.org taking a stand against animal abuse. The Secure Snuggler may have a pricier ticket; it is made in the USA. 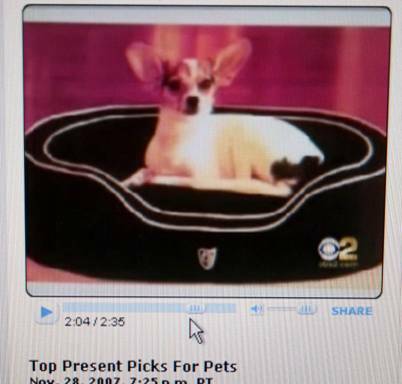 The company does market themselves as" The Worlds Finest Pet Bed." Ergonomic Pet Beds: The Secure Snuggler ® dog bed by Cashmere Co. The goal of the company was to create a place of rest that would cradle the developing structure of a puppy and adapt to the aging process providing an exclusive individual support system. A frame of moisture resistant minicel construction and a memory foam mattress are covered in a plush blend of cashmere and merino wool providing cozy support and maximum relaxation. This Dog Bed gently soothes the parasympathetic nervous system making way for peaceful sleep and rest. The time has come to rid our homes of bun foam and stuffed polyester mattresss. Finally, our faithful companions have found a dog bed that is handmade, well-crafted, luxuriously therapeutic snuggler. Happy pet owners fondly refer to the Secure Snuggler as the world’s finest dog bed. This dog bed French Poodle of dog beds, has the heart of a bulldog and illuminates the pet market as a fine bed indeed, worthy of your best friend. "You cannot go wrong with Cashmere; our customers love The Secure Snuggler”. Owner of Modern Dog, Venice Beach CA. 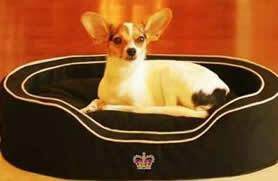 The Illustrious Italian Cashmere-Merino Wool Dog Bed.....Bow wow! The illustrious classic design and an array of stylish colors enhance tasteful home decor. 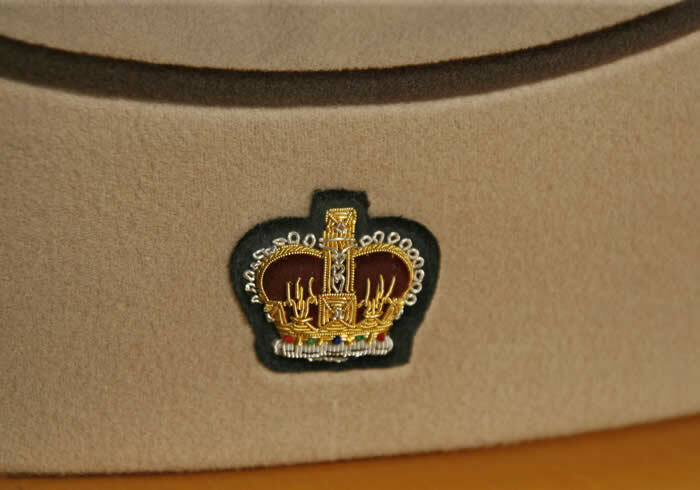 A Royal Bullion Encrusted Crown logo proclaims the arrival of the most innovative source for peace and comfort ever designed with a dog’s wish in mind. The time has come for rover to cozy up with Soft Cashmere, Wool blended luxury. Our four legged angels have found doggie heaven, resting for hours within the embrace of this snuggly ergonomic bed. The plush memory form mattress conforms to every dog’s individual bone structure while gently soothing the parasympathetic nervous system like a lullaby. The illustrious classic design and an array of stylish colors and other illustrious fabrics will enhance the decor of your home.. A Royal Bullion Encrusted Crown logo proclaims the arrival of the most innovative source for peace and comfort ever designed with a dog’s wish in mind. "You cannot go wrong with Cashmere; our customers love The Secure Snuggler," stated Guy owner of Modern Dog, Venice Beach CA. The Secure Snuggler ® by Cashmere Co. is a registered trademark. Availability of the product is 2 to 6 weeks depending on color. Wholesale orders and personalized orders are available. The Secure Snuggler ® by Cashmere Co. The Secure Snuggler® is proudly handmade in the USA with an Italian Cashmere and Merino Wool and and other illustrious fabrics chosen to give your dog a cozy sense of well being. The Secure Snuggler® is designed for the ultimate ergonomic comfort of your pet. Los Angeles, CA. March 15, 2008: Sherwin Ross, partner ofCashmere Co. announced today the release of "The Secure Snuggler®." He explains, "The reason we created The Secure Snuggler® is to meet the challenges of today's economy. We have produced a luxury product at a moderate price point. The research and creation of The Secure Snuggler® has succeeded in cutting the costs of The Cashmere Classic 100% Cashmere bed by 60%. The Secure Snuggler boasts a beautiful bullion crested crown, a carry bag and a spectacular artisanship that make this Luxury Dog Bed outstanding. Our memory foam mattress, and revolutionary bed frame is firm at the same time soft for the ergonomic comfort of your pet, ensuring a soothing effect on the para-symmetric nervous system of your pet. www.friendsofcashmereboutique.com Available now on quality dog beds and make your furry little friends happy. "The Secure Snuggler® The Worlds Finest Pet Bed is as perfect for a newborn baby as it is for your beloved dog." The world's finest pet bed is proudly handmade in the USA with an Italian Cashmere and Merino Wool and and other illustrious fabrics chosen to give your dog a cozy sense of well being. The bed is designed for the ultimate ergonomic comfort of your pet. Our memory foam mattress, and revolutionary bed frame is firm at the same time soft for the ergonomic comfort, ensuring a soothing effect on the para-symmetric nervous system of your pet. Sherwin Ross, who after a year of working with Jeff Rudes of J-Brand Jeans developing a 100% Cashmere dog bed, realized that the time had come to take a stand for products that would not be high maintenance for the elite few. At the same time, Sherwin had the nagging question, "Would people sleep on what is offered today for their own pets?" This bed is as perfect for a newborn baby as it is for your loving pet. Through trial and error, we have produced a luxury product at a moderate price point. This bed boasts a beautiful bullion crested crown, a carry bag and a spectacular artisan ship that make this luxury dog bed outstanding. Proudly handmade in the USA with an Italian Cashmere and Merino Wool and and other illustrious fabrics chosen to give your dog a cozy sense of well being. This classic dog bed is designed for the ultimate ergonomic comfort of your pet as well as a luxurious piece of furniture that will sit in any room of any fine home and become a conversation peace. The bed comes in two sizes, Classic (23” x 17” x 6”, MSRP $249.99 and The Toy (19.5” x 14” x 5”, MSRP $199.99). There are nine attractive color combinations to choose from. The bed’s design provides “man’s best friend” with the greatest comfort, while adding a classy and fashionable design element to any room. These luxury beds will be available at high-end department stores, luxury hotels, and pet retailers that cater to the discriminating buyer and his or her pets. Founded in 2007 The Secure Snuggler ® by Cashmere Co. is dedicated to producing pet products that any four-legged friend will love promising companion animals the most comfortable pet bed they have ever stepped their paws in. The Secure Snuggler® The Worlds Finest Pet Bed is proudly handmade in the USA with an Italian Cashmere and Merino Wool and and other illustrious fabrics chosen to give your dog a cozy sense of well being. The Secure Snuggler® is designed for the ultimate ergonomic comfort of your pet. Our memory foam mattress, and revolutionary bed frame is firm at the same time soft for the ergonomic comfort, ensuring a soothing effect on the Para-Symmetric nervous system of your pet. The Secure Snuggler® is proudly handmade in the USA with an Italian Cashmere and Merino Wool and and other illustrious fabrics chosen to give your dog a cozy sense of well being. This classic Dog bed is designed for the ultimate ergonomic comfort of your pet as well as a luxurious piece of furniture that will sit in any room of any fine home and become a conversation peace. The Secure Snuggler® dog bed comes in two sizes, Classic (23” x 17” x 6”, MSRP $249.99 and The Toy (19.5” x 14” x 5”, MSRP $199.99). There are nine attractive color combinations to choose from. The bed’s design provides “man’s best friend” with the greatest comfort, while adding a classy and fashionable design element to any room.Cashmere Co. secure snuggle pet beds are will be available at high-end department stores, luxury hotels, and pet retailers that cater to the discriminating buyer and his or her pets. Los Angeles, February 24th 2008 - TALL TAILS Wanting to "fit" in at the Los Angeles, Luxury Pet Pavilion Show, GIBSON, the world's largest dog wishes for a large size version of "The Secure Snuggler® by Cashmere Co." by Sherwin Ross. Gibson is given sweet consolation by MacKenzie Mauzy, 2008 Emmy Award Nominee from The Bold and the Beautiful, and co star od Disney's "into the Woods" with Meryl Streep. 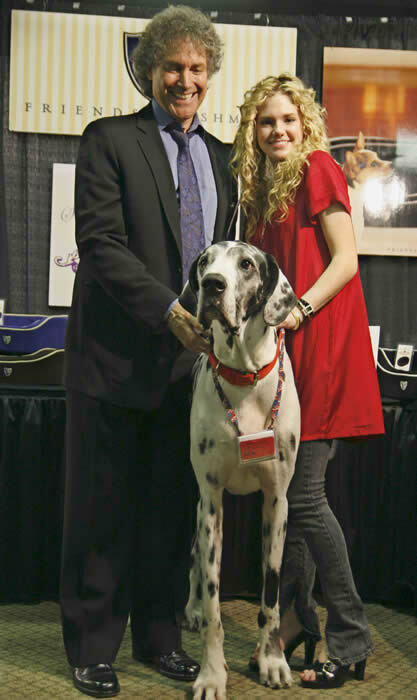 Having rescued her own sweet pet Darcy, Mauzy is looking forward to working with Gibson’s “Angel on a Leash Foundation. She was supporting his cause at the Secure Snuggler station during the show. Your Dog is ready for a luxurious Cashmere Bed with a Memory Foam mattress by Cashmere Co.
Los Angeles, CA. 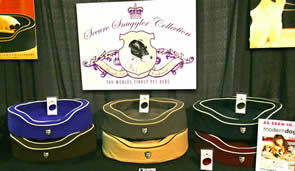 March 10, 2008:Cashmere Co. announced today the release of "The Secure Snuggler®. "The reason we created The Secure Snuggler® is to meet the challenges of today's economy. We have produced a luxury product at a moderate price point. The research and creation of The Secure Snuggler® has succeeded in cutting the costs of The Cashmere Classic 100% Cashmere bed by 60%. The Secure Snuggler boasts a beautiful bullion crested crown, a carry bag and a spectacular artisanship that make this Luxury Dog Bed outstanding. Our memory foam mattress, and revolutionary bed frame is firm at the same time soft for the ergonomic comfort of your pet, ensuring a soothing effect on the para-sympathetic nervous system of your pet. The Secure Snuggler® dog bed comes in two sizes, Classic (23” x 17” x 6”, MSRP $249.99 and The Toy (19.5” x 14” x 5”, MSRP $199.99). There are nine attractive color combinations to choose from. The bed’s design provides “man’s best friend” with the greatest comfort, while adding a classy and fashionable design element to any room. The Secure Snuggler ® by Cashmere Co.pet beds are will be available at high-end department stores, luxury hotels, and pet retailers that cater to the discriminating buyer and his or her pets. Founded in 2007 The Secure Snuggler ® by Cashmere Co. is dedicated to producing pet products that any four-legged friend will love. The Secure Snuggler® promises companion animals the most comfortable pet bed they’ve ever stepped their paws in. Los Angeles, CA. March 10, 2008: Sherwin Ross, partner ofCashmere Co. announced today the release of “The Secure Snuggler®.” He explains, "The reason we created The Secure Snuggler® is to meet the challenges of today’s economy. We have produced a luxury product at a moderate price point. The research and creation of The Secure Snuggler® has succeeded in cutting the costs of The Cashmere Classic 100% Cashmere bed by 60%. Do you know what cashmere is? Well the cashmere is among the items that are considered a luxury item. Much use the cashmere on the creation of scarves, turban, mattresscase and many more, but do you know where the cashmere came from? But other than mattress cases or scarves, cashmere can also be seen on dog beds called a Cashmere dog bed, and this was the idea of a couple that decided to put their entrepreneurial spirit to the test when six months prior, one night - after noticing that every cashmere item of theirs they left around the house attracted their beloved little dogs, DALI & JEZEBEL, like magnets - it dawned on them, what if we made Cashmere dog bed. Six months later, here they are, bringing their love, passion and talent to life - a Cashmere dog bed at home, one that DALI and JEZEBEL won't leave, andCashmere Co. dog beds are available for all dogs.Cashmere Co. dog beds are dedicated to DALI & JEZEBEL, our Inspiration. MacKenzie Mauzy emee nominated actress from CBS Bold and The Beautiful. Visits with Gibson The Worlds Tallest Dog at TheCashmere Co.
Los Angeles, February 24th 2008 - TALL TAILS Wanting to "fit" in at the Los Angeles, Luxury Pet Pavilion Show, GIBSON, the world's largest dog wishes for a large size version of "The Secure Snuggler® by Cashmere Co." Gibson is given sweet consolation by MacKenzie Mauzy, 2008 Emmy Award Nominee from The Bold and the Beautiful. Having rescued her own sweet pet Darcy, Mauzy is looking forward to working with Gibson’s “Angel on a Leash Foundation. She was supporting his cause at The Secure Snuggler® station during the show. 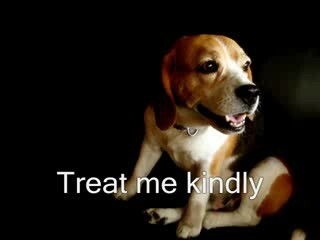 "A Dogs Wish" Treat me kindly, my beloved friend.. The Secure Snuggler® Hollywood, CA, United States The Secure Snuggler® by Cashmere Co. is born of inspiration and out of love for our precious pets. The The Secure Snuggler® is proudly handmade in the USA with quality materials chosen to give your dog a cozy sense of well being. We, at Secure Snuggler, have designed the ultimate ergonomic comfort with plush rich fabrics and Lux appeal. The walls of The Secure Snuggler® are made from an expensive material that is firm for comfort at the same time soft. and The luxurious memory foam "pedic mattress" conforms to your dog's skeletal structure, insuring individual support and maximum rest. Move over Fluffy, we want in that bed. And we're not talking about our own 400-thread-count Frette duvet cover. The most popular spot in our house is a new cashmere dog bed. Thisluxurious bed is covered in a ridiculously soft blend of Italian Cashmere and Merino Wool and and other illustrious fabrics. Nap time has been elevated to an art form with this new piece. When the wind is whipping at the door, our little angel never experiences the slightest shiver or chill. Fit for a king or queen, the beds' regal color selections would be perfect for any castle (Royal Dog Blue anyone?). The only problem is now our dog is demanding breakfast in bed and has been requesting a tiara. The "The Secure Snuggler® by Cashmere Co. pet bed's make their West Coast debut with the world’s first cashmere pet bed at Luxury Pet Pavilion February 23-24 at Westin Bonaventure Hotel in Los Angeles. Friends of Cashmere’s “Classic Bed” line features an innovative high-quality custom molded polyurethane base, an ergonomic memory foam mattress. The zip-off bed cover and mattress case are made of the finest woven Italian cashmere Merino wool blend. The bed comes in two sizes, Classic (23”x17”x6”, MSRP $249.99 and The Toy (19.5”x14”x5”, MSRP $199.99) There are nine attractive color combinations to choose from. The bed’s design provides “man’s best friend” with the greatest comfort, while adding a classy and fashionable design element to any room. "The Secure Snuggler® by Cashmere Co. pet beds are will be available at high-end department stores, luxury hotels, and pet retailers that cater to the discriminating buyer and his or her pets. · The Dakota Days – White with white piping. "The Secure Snuggler® by Cashmere Co. dog bed has set a new standard in pet bedding. Created to provide an ergonomic comfort that combines with Mother Nature's gift of cashmere and merino wool, which naturally soothe the parasympathetic nervous system of animals. "This is a revolutionary product," explains Andrew Rosenthal, owner of LA Dog Works, expert in pet care and technical advisor in creating this product. "The Bed" is designed for therapeutic comfort and longevity. "There is nothing as beautiful and as luxurious as our pet bed in the market place." (Houston, TX/November 30, 2007) -- American’s are expected to dish out a staggering $474.5 billion this year on Christmas shopping, according to the National Retail Federation (NRF). Jim Trippon, CPA and one of America’s foremost authorities on the money habits of self-made millionaires, has released his annual list of the most expensive gifts to give your loved ones this holiday season. The NRF said that Americans plan to spend an average of $923.36 in total this year, up 3.7 percent from the previous year’s statistics. Given the credit card rates that are often at 24 percent and assuming minimum payments, Trippon says that this year’s holiday shopping will cost the average consumer closer to $6458.87 when interest and finance charges are included. Trippon believes that people avoid arguing about finances when they take the time to become educated about money together. Trippon is the author of the Amazon best-seller, How Millionaires Stay Rich Forever: Retirement Planning Secrets of Millionaires and How They Can Work For You and the upcoming title, China Stock Guru. For further information or to schedule an interview with Jim Trippon, contact Amal Zaid at 713-661-3806. The online media center is located at: Christmas Gift List 2007. TOP TEN REASONS WHY: YOU’RE DOG SHOULD BE SLEEPING ON AN ERGONOMIC PET BED. 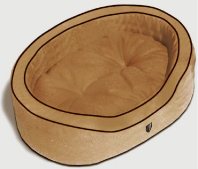 A Luxury Dog Bed with memory foam offers ergonomic comfort and orthopedic support for you dog. Move over Fluffy, we want in that bed. And we're not talking about our own 400-thread-count Frette duvet cover. The most popular spot in our house is a new cashmere dog bed. This luxurious bed is covered in a ridiculously soft blend of Italian Cashmere and Merino Wool and and other illustrious fabrics. Nap time has been elevated to an art form with this new piece. When the wind is whipping at the door, our little angel never experiences the slightest shiver or chill. 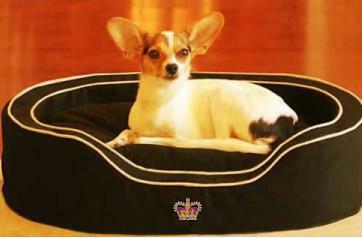 Fit for a king or queen, the beds' regal color selections would be perfect for any castle (Royal Dog Blue anyone?). The only problem is now our dog is demanding breakfast in bed and has been requesting a tiara. Friends of Cashmere’s “Classic Bed” line features an innovative high-quality custom molded polyurethane base, an ergonomic memory foam mattress. The zip-off bed cover and mattress case are made of the finest woven Italian cashmere Merino wool blend. The bed comes in two sizes, Classic (23”x17”x6”, MSRP $249.99 and The Toy (19.5”x14”x5”, MSRP $199.99) There are nine attractive color combinations to choose from. The bed’s design provides “man’s best friend” with the greatest comfort, while adding a classy and fashionable design element to any room. "The Secure Snuggler® by Cashmere Co. pet beds are will be available at high-end department stores, luxury hotels, and pet retailers that cater to the discriminating buyer and his or her pets. Retirement Planning Secrets of Millionaires and How They Can Work For You and the upcoming title, China Stock Guru. Copyright © 2008 The Secure Snuggler ® by Cashmere Co.